Tucker found an old R-MWC hat and wore it all day. He and Chad went to the grocery store and he had it on. We went to play with Hattie and Noah and he had it on. Even this afternoon when he woke up from his nap, he immediately asked about "muh hat." He would only wear it backwards because when he wore it correctly, the brim fell down in his face. 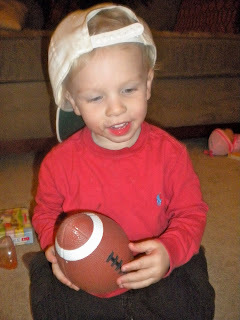 He has also been carrying around this football nonstop. 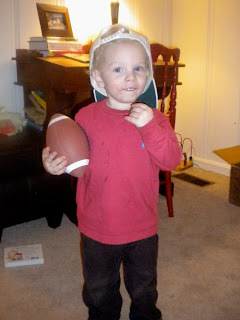 He knows how to say (and motion) "touchdown" and bend over and say "down-set-hike." He is most definitely a little boy!! !